Businesses regularly shipping expensive items like jewelry understand how important it is to keep the items protected throughout the transportation process. Maintaining security can be quite challenging since the packages pass through several hands before ultimately reaching the recipient. One way to minimize this risk is to make sure you use effective shipping materials. Reducing the risk of loss or theft protects your business’ reputation and minimizes the product replacement and reshipping costs. Here are a few of the many business consequences for lost or stolen expensive products. Insurance: If you are shipping jewelry that costs hundreds to thousands of dollars, you clearly need insurance to protect your items. Insurance companies penalize companies with multiple claims, so it is critical that you do everything in your power to minimize them. If not, you’ll be in a position where your insurance premiums rise precipitously or worse, you have difficulty obtaining insurance. Corporate Reputation: Customers have increasingly high expectations of the business’ they purchase from. E-commerce customers expect their purchases to be high quality, to arrive in pristine condition and to be shipped and packaged in a style reflecting the brand from which they are buying. When items do not make it to the customer on time, or worse, have been stolen, they will blame your company. Your company will have to do everything possible to regain their trust and prove that your company will meet its obligations by making the necessary adjustments in a quick and seamless manner. The best course of action is to make sure that your products arrive on-time and intact. Corrugated cartons are made up of three layers of paper that include an inside liner, an outside liner, and fluting with a ruffled shape, which runs in between the two. This type of material enhances the packaging process in many ways. It is durable. It’s lightweight. It provides product protection. It is cost-effect and environmentally-friendly. 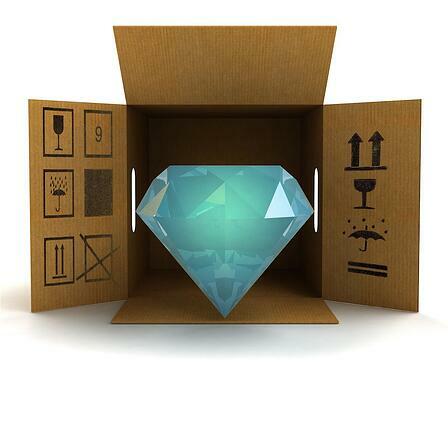 Corrugated cartons are often used to protect large items, but are available in smaller sizes, just right for jewelry. Water-activated tape also known as gummed tape is made primarily of white or natural color (Kraft) paper and a starch-based adhesive. This packaging tape is available in various widths and thicknesses and when reinforced, contains multiple layers of fiberglass. Once the adhesive is activated with water, it penetrates the corrugated carton material and forms a permanent bond with the carton. This bond is critical for product safety because the strong seal eliminates undetected carton intrusion along with the possibility of the tape peeling and permitting items to fall out. Theft is a serious product safety issue and unfortunately happens all too often in cartons with a weaker seal. Water-activated packing tape provides a tamper-evident seal that discourages theft. Since it is so secure, you only need to use one strip to seal your cartons. One neat and clean strip enhances the professionalism of your brand. Plastic, pressure-sensitive tape can be easily removed and resealed without any sign of package entry. You never want the customer to find that items are missing upon receipt of the package. This situation can be avoided by using reinforced gummed tape. Your shipping label should not include any reference to the fact that there is jewelry in the carton. Doing so is an invitation for theft. Better to just use your first and last name or your initials along with your mailing address for your return address. The same applies if you are receiving jewelry items. Have your purchases sent to you using your personal name and not the name of your business if your corporate name includes a reference to jewelry. Better Packages offers a full line of gummed packaging tape dispensers, along with the Central® brand of water activated tape through its parent company, Intertape Polymer Group (IPG). Water activated tape (also known as gummed tape, gum tape, Kraft paper tape, reinforced paper tape) is designed to create a superior seal on corrugated cartons while providing advantages other carton sealing methods do not. Central brand water activated carton sealing tape is offered in a wide range of paper and reinforced gummed paper tape styles, roll lengths and widths to best fit your carton sealing needs. It is the preferred choice of packaging specialists when quality, strength, security and professional appearance are critical. Still wondering if water-activated tape is right for your company? Request a sample and explore the enhanced carton sealing solutions for yourself.